The technique of Vipassana is a simple ,practical way to achieve real peace of mind and to lead a happy, useful life .Vipassana means “to see things as they really are”; it is a logical process of mental purification through self-observation . From time to time, we all experience agitation, frustration and disharmony. When we suffer,we do not keep our misery limited to ourselves; instead,we keep distributing it to others. Certainly this is not a proper way to live. We allwant to live at peace within ourselves,and with those around us. After all,human beings are social beings :we have to live and interact with others. How,then ,can we live peacefully? How can we remain harmonious ourselves, and maintain peace and harmony around us? Vipassana enables us to experience peace and harmony : it purifies the mind ,freeing it from suffering and the deep-seated causes of suffering .The practice leads step-by-step to the highest spiritual goal of full liberation from all mental defilements. Vipassana is one of India’s most ancient meditation techniques. It was rediscovered 2500 years ago by Gotama the Buddha, and is the essence of what he practiced and taught during his forty-five year ministry.Duringthe Buddha’s time, large numbers of people in northern India were freed from the bonds of suffering by practicing Vipassana ,allowing them to attain high levels of achievement in all Spheres of life. Over time, the technique spread to the neighboring countries of Myanmar (Burma), Sri Lanka, Thailand and others ,where it had the same ennobling effect. Five centuries after the Buddha ,the noble heritage of Vipassana had disappeared from India.The purity of the teaching was lost elsewhere as well .In the country of Myanmar, however ,it was preserved by a chain of devoted teachers .From generation to generation over two thousand years,this dedicated lineage transmitted the technique in its pristine purity. In our time ,Vipassana has been reintroduced to India,as well as to citizens from more than 150 other countries,by S.N. Goenka. He was authorized to teach Vipassana by the renowned Burmese Vipassana Teacher, Sayagyi U Ba Khin. Before he died in 1971 ,Sayagyi was able to see one of his most cherished dreams realized. He had the strong wish that Vipassana should return to India ,the landOf its origin, to help it come out of its manifold problems. From India ,he felt sure it would then spread throughout the world for the benefit of all mankind. S.N.Goenka began conducting Vipassana courses in India in 1969;after 10 years, he began to teach in foreign countries as well. In the 45 years since he started teaching ,S.N. Goenka has conducted many ten-day Vipassana courses ,and trained over800 assistant teachers who have conducted many courses worldwide. In addition ,many centres have been established in India for the exclusive practice of Vipassana. Centres for exclusive practice have been established across the world as well. The invaluable gem of Vipassana,long preserved in the small country of Myanmar,can now be practiced in many places throughout the world .Today ever-increasing numbers of people have the opportunity to learn this art of living which brings lasting peace and happiness. In the past ,India had the distinction of being regarded as a world Teacher .In our time ,the Ganges of Truth is once again flowing out from India to a thirsty world. Though Vipassana it is necessary to take a ten-day residential course under the guidance of a qualified teacher.The courses are conducted at established Vipassana Centres and other places .For the duration of the retreat, students remain within the course site, having no contact with the outside world. They refrain from reading and writing, and suspend any religious practices or other disciplines . They follow a demanding daily schedule which includes about ten hours of sitting meditation.They also observe silence ,not communicating with fellow students; however, they are free to discuss meditation questions with the teacher and material problems with the management. There are three steps to the training .First ,the students practice abstinence from actions which cause harm. They undertake five moral precepts,practicing abstention from killing, stealing,lying,sexual misconduct and the use of intoxicants. The observation of these precepts allows the mind to calm down sufficiently to proceed with the task at hand. Second ,for the first three –and-a-half days,students practice Anapanamedition,focusing attention on the breath.This practice helps to develop control over the unruly mind. One penetrates oneself’s entire physical and mental structure with the clarity of insight. Students receive syatematic meditation instructions several times a day ,and each day the progress is explained during a taped evening discourceby S.N.Goenka.Complete silence is observed for the first nine days.On the tenth day,students resume speaking ,making the transition back to a more extroverted way of life. The course concludes on the morning of the eleventh day. The retreat close with with the practice of metta-bhavana (loving-kindness or good will towards all), a meditation technique in which the purity developed during the course is shared with all beings.Pictorial representation of a 10 day retreat at Dhammagiri. Vipassanacourses are held regularly at permanent centres and rented sites in different countries. 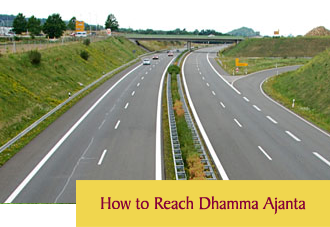 In addition to frequent ten-day courses ,special courses and long courses of 20,30,45 and 60 days are offered for advanced students at long course centres like DhammaTapovanextablishedfor this purpose. Short , courses in Anapana ,the introductory part of the Vipassana technique ,are courses offered For children in India and in other countries. All courses throughout the world are run solely on the basis of freely-offered donations.No fee charged:the courses are financed totally by donations from students who have completed a prior course and wish to share the benefits they themselves received by giving donation for the students who come after them. Neither the Teacher nor the assistant teachers receive remuneration ; they and those who serve the courses volunteer their time.This practice is consistent with the pure tradition, whereby the teaching is to be offered freely ,free from any taint of commercialism,and supported solely by donations stemming from the wholesome volitions of gratitude and generosity. Although Vipassana is a part of Buddha’s teaching ,it contains nothing of a sectarian nature,and can be accepted and applied by people of any background .The Buddha himself taught Dhamma (the way,the truth,the path).He did not call his followers “Buddhists”; he referred to them as “Dhammists” (those who follow the truth).The technique works on the basis that all human Buddhists share the same problems ,and a pragmatic method which can eradicate these problems can be universally practiced. Vipassana courses are open to anyone sincerely wishing to learn the technique ,irrespective of race,caste,faith or nationality.Hindus ,Jains ,Muslims,Sikhs ,Buddhists,Christians,Jews as well as members of other religions have all successfully practiced Vipassana.The malady is universal ;thefore,the remedy has to be universal .For example,when we experience anger,this anger is not Hindu anger or Christian anger,Chinese anger or American anger.Similarly,love and compassion are not the strict province of any community or creed:they are universal human qualities resulting from purity of mind .People from all backgrounds who practice Vipassana find that they become better human beings. Developments in the fields of science and technology,intransporatation,communications,agriculture and medicine ,have revolutionized human life at the material level. But,in actually ,this progress is only superficial :underneath,modern,men and women are living in conditions of great mental and emotional stress, even in developed and affluent countries. The problems and conflicts arising out of racial,ethnic,sectarian and caste prejudices affect the of every country.Poverty,warfare,weapons of mass destruction,disease,drug addiction,the threat of terrorism,epidemic,environmental devastation and the general decline of moral values all cast a dark shadow on the future of civilization.One need only glance at the front page of a daily newspaper to be remined of the acute suffering and deep despair which afflict the inhabitants of our planet.Is there a way out of these seemingly insolvable problems? The answer is unequivocally,yes .Allover the world today,the winds of change are readily apparent. People everywhere are eager to find a method which can bring peace and harmony; restore confidence in the efficacy of wholesome human qualities;and create an environment of freedom and security from all types of exploitation in social ,religious and economic.Vipassana can be such a method. Please note: All courses are conducted by assistant teachers appointed by Shri S.N. Goenka. Please send the application form to the course organisers only after reading the code of Discipline so that a place may be reserved for you. One-day, 2-days and 3-day courses are only for old students who have completed 10-day course with Goenkaji or his authorised assistants. Satipatthana courseends on the evening of the last day and are for students who have completed at least three 10-day courses and are practicing regularly for the last one year. 20-day and special 10-day course: 5 X 10-Day courses sat, 1 X 10-Day course in Dhamma service, 1 X SatipatthanaSutta course sat. 30-day: 6 X 10-Day courses sat (1 since 20-Day course), 1 X SatipatthanaSutta course sat, 1 X 20-Day course sat. 45-day: 7 X 10 Day courses sat (1 since 30-Day course), 2 X 30-Day courses sat. Admission limited to ATs or persons involved in Dhamma service.